One example of food fraud is the adulteration of liquid food products, such as juices, by watering them down. Government regulations dictate that the natural sugar content of fruit juices be at a specified level, which is referred to as a “standard of identity”. For example, in some countries orange juice may require a sweetness level indicated by 10.5% of naturally-occurring sugars on a weight basis. A devious processor or street vendor could easily add water to lower the sugar level to 9%, which would still taste sweet enough to many consumers. If a deceitful processor wanted to maintain the sweetness level of the orange juice, it would be a simple matter to do so. 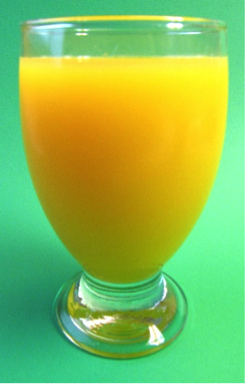 The original orange juice could be diluted with a solution containing 10.5% sugar in water. Adding the cheap sugar solution to the more costly orange juice would give extra profit to the seller at the expense of a ripped-off customer. Unless the unsuspecting purchaser had a sample of authentic juice for comparison, chances are quite good that the adulteration would go undetected. You may be asking yourself how this can occur when there are tests available that should supposedly be able to detect this type of food fraud. While this is true, such tests often require sophisticated laboratory equipment that cannot be used for testing in the field. In addition, it is not possible to test all the millions of litres of juice products that are sold each year. Someone once told me that a skillful adulterator could take one litre of milk, dilute it to four litres, and still fool the consumer. Even if this is an exaggeration, it is rather mind-boggling when you think about it. So, how would you actually do this? One of the tests done on milk involves determining the amount of protein that is present. Proteins are unique molecules in that they contain nitrogen in their amino acid building blocks. Very few other molecules in our food contain nitrogen. In general, about 16% of the weight of a protein molecule is made up of nitrogen. Chemists can break down samples in lab tests and analyze them for their nitrogen content. Knowing the nitrogen content then allows the initial protein concentration to be calculated. In order to fool the lab tests, it is possible to add chemicals having a high nitrogen content to the product. One such chemical is urea, found in fertilizer, which contains about 47% nitrogen by weight. However, the real culprit for food fraud is melamine which contains an amazing 67% nitrogen by weight. It only takes a bit of basic math to calculate how much urea or melamine must be added to a diluted batch of milk to mislead the lab analysis into thinking there is a high level of protein present. A bit of sugar can be added to make up for the dilution of the naturally-occurring lactose, and the watery mouth-feel can be easily adjusted. The problems with adding adulterants such as melamine go far beyond cheating the consumer. There are frequently severe impacts on the health of those consuming these compounds. Kidney failure is one of the major results. Some of you may recall the events of 2008 with melamine in infant formula and powdered milk in China, and pet food in North America. More recently, in early 2017, there were reports of how imported adulterated honey was being sold in North America at lower prices than high-quality domestic honey. Cheaper sugars were being used to maintain levels of sweetness. As a result, profits of local honey producers plummeted. To restore consumer confidence, a number of companies responded by issuing guarantees that they only used honey from reputable domestic suppliers. Hopefully, this situation has now been resolved. When writing an article on a potentially sensitive topic, I want to avoid causing panic or undue worry for anyone. That being said, it is relatively easy to protect yourself from much of this deception. Buying products from reputable companies, whose brands are familiar and trusted, is your first line of defence. These are the companies that value your loyalty and want you as a repeat customer, which means they will be doing everything possible to deliver consistently high-quality products.